Malmesbury was regarded as a sanctuary where Guinevere died and was supposedly buried, but according to Malory was interred at Glastonbury. Ambrosius Aurelianus during the 5th century was the last Romano-British leader who rallied the Saxon invasion. Arondight was the sword of Sir Lancelot. The Arthurian Romances have King Arthur as the central figure. They appear in 1136 with Monmouth’s Historia Regum Britannium. Verified by Wace in his Roman de Brut or Brut d’Angleterre of 1155. The first mention of the Round Table was in Brut. Then in 1205 in Layamon or the Brut in English. Then the addition of fairies to Arthur’s birth and death. France in the late 12th century AD – Robert de Borron introduced the Grail story and the prominence of Merlin. 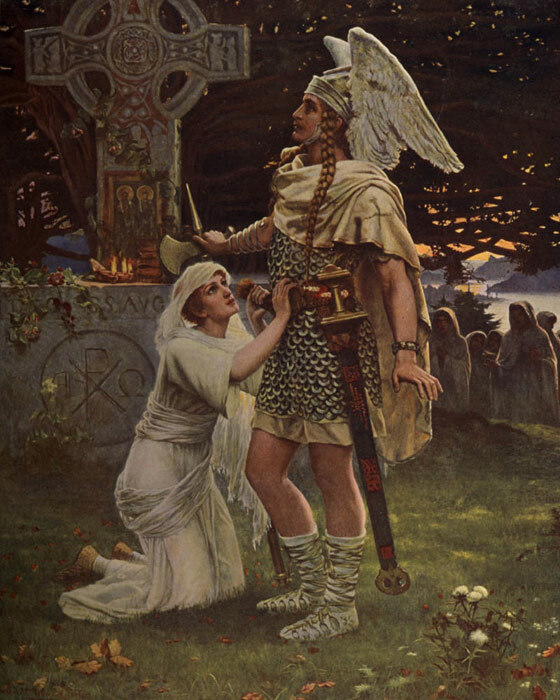 Chretien de Troyes introduced the story of Enid, as well as Geraint, Lancelot and Guinevere, Percival and stories from Welsh sources – the Mabinogion. This was the introduction to romantic chivalry. The legend was popularised by Welsh and Breton ballads and lays. Collected by Thomas Mallory (d. 1471) and known as Le Morte d’Arthur. Produced by Caxton in 1485 [Note – Idylls of the King. Tennyson]. The Figure of Arthur [Barber. 1972]. The Arthurian controversy – end of 5th century, and Battle of Badon Hill circa 516. Supposedly a descendant of the Roman gens Artorius. Continued success of Ambrosius Aurelius [Note – William of Malmesbury – first chronicler of Glastonbury]. Camelot – 12th century invention without any basis in native poetic tradition. Celts were intrigued with place names. After 9th century Arthur became the basis of tales and heroic deeds. Early heroes were forgotten and replaced y newly prominent figures. Arthur fought 12 battles according to Nennius who wrote the History of the Britons. See 6th century poetry and welsh literary works of great antiquity. Literary evidence consists of fragments and Welsh stories of Arthur. British history in the 6th century is blank. Arthur appears as the last bearer of the flame of Roman civilisation. Arthur is a mutation from obscurity to legendary renown. Note that The Song of Roland shows the mechanisms of medieval myth making. A historical Roland is unknown. There is a reference to his death in Egnihardt’s Life of Charlemagne [See Wace the Roman de Ron, circa 830 AD]. The retreat from Spain without a heroic figure says “In this battle died Eggehard…Anshelm…and Roland, Lord of the Breton Marshes”. Roland was the Hruotland killed at Roncevalles. Later around 1030 in the Chanson de Roland he is the central character. Also Charlemagne’s nephew. Note Taillefer of the 9th century and the 12 Paladins. In the Chanson de Roland (the Chanson de Geste is ascribed to Trouvere or Theroulde or Turoldus) partly there is an increasing hardening of attitudes between Christianity and heathendom. The First Crusade arose out of this? Roland is religious ideology seen in Orlando Furioso. Whereas Arthur is nationalist ideology and thus the use of myth as ideology. Arthurian Romances = purely literary development. Lancelot, Perceval = elevated (originally obscure). Parzival – Eschenbach. Galahad = Holy Grail Quest – purely literary invention (influence of Cistercian monks). Einhard and Notker). Roland [see Turpin died 974] = Christian ‘Theseus’ or ‘Achilles of the West’. See – Antonio, Pulia, Broiardo. Frankish chivalry – romance. Arthur = mythology. Mythology = in a degenerate form is easily transmitted into folklore and heroic tales. Welsh tales = pagan deities (appear as heroes with strange attributes) – tribal. Arthur usurped the characteristics of older, forgotten heroes. Galahad supplanted Perceval and Lancelot supplanted Gawain. Arthur of Dalriada – end of 6th century = British – went through Northumberland and Yorkshire to attack ‘men of Lloegr.’ (English invaders). Britons = household of Mynyddog (ruled from Edinburh). Manau Goddoddin = Firth of Forth plus South Lothian. With troops – Aneurin. At Catterick (Catraeth) – battle. British loss and retreat. Aneurin escaped and wrote a set of elegies = The Goddoddin. The social background = warlike, autocratic. Christianity was a veneer. The Northern Heroic = pre-feudal or transition. A handful of characters of Goddoddin appear in later legends. Two do not = Eithinyn (“he was not Arthur”) – Elfin and Gwawrddr. [Later poems – Elfin = Taliesin master. Taliesin = Rheged? (Carlisle). Early records = Alpinus (Elfin derived?). The Goddoddin belongs to the formative years of heroic myths. Earliest mention of British poets, (after Roman occupation) = Gildas – “De Excidio Britanniae” (On the Ruin of Britain) = 6th century middle? [50 years before Goddoddin]. Writes of Maglocunus (Maelgwn). Other classical writers speak of poets, seers, priestly druids. Greek writer = Posidonius. Difference – religious functionaries and the court poets. 5th and 6th centuries = sub-Roman structure. Traces of pagan myth reappear in later poetry. Derived from folk literature and Druidic traditions. Taliesin and Aneurin = Cynfeirrd = first poets of new Welsh/Cambric poetry. Cynfeirrd = Clan, Bluchbard, Talhaeam. No works survive. Utopian? – reverence for past developed by 9th century. Permeates Welsh poetry. The Goddoddin – Tudfwich Hir (men who slew English). Taliesin = “Lament for Owain ab Urien.” Welsh heroic poetry retained feelings and structure of a primitive society grouped in small units. Anglo-Saxons outgrew this. Beginning of 7th century = British kingdoms – Edinburgh to Penzance = Rheged, Goddoddin, Strathclyde, Dalriada. Dalriada or Argylle = Irish immigrants, early 4th and 5th century. Far north – Picts dividing into tribes. Men of Gododdin fought against Saxons, Irish, Picts + other British kingdoms. [Gododdin = East Scotland]. Mid-7th century – Gododdin oerirun. Strathclyde/Dalriada alliance broke down in 7th century. Struggle for the Saxon hegemony won by Oswy from Penda by 656. Battle of Chester – 616 Ad = link – Welsh and North broken. Winwaed Field – 655 AD – defeat of Penda and Welsh allies by Oswy. Wales + Mercia? Reunion with north now disappeared. Eagfrith’s death at Nechttanmere (685) = decline of Saxon power in Scotland. Man of Goddodin fought against Saxons, Irish, Picts + other British kingdoms. [Goddodin = East Scotland]. Mid-7th century – Godddodin overrun. Strathclyde/Dalriada alliance broke down in early 7th century. Struggle for the Saxon hegemony won by Oswy from Penda in 656 AD. Battle of Chester (616 AD) = link – Welsh and North broken. Winwaed Field – 655 AD – defeat of Penda and Welsh allies by Oswy. Wales + Mercia? Reunion with North now disappeared. Eagfrith’s defeat at Nechtanmere (685 AD) = decline of Saxon power in Scotland. Hegemony won by Dalriada (Irish kings) in Scotland [early 10th century]. Traditions of Britons not preserved there – ‘Gwyr y Gogledd’. Welsh culture remained largely unrecorded in writing until the 13th century. Previously = panegyric poems, chronicles, genealogies. Northern rulers brought south – 7th-8th centuries. No surviving southern poetry of 7th-8th century. Cyan (?) Gar wyn of Powys = eulogy (Taliesin). Taliesin – fame began = court of Urien of Rheged. Early poems from Powys = Llyarch the Old = 9th century. Evocate 7th century. South Wales poetry – concerned with past, heroic figures [no current events or themes] = Golden Age. Utopian? Heroic age was over. Northern Heroic = upper barbarism? Fair deeds woven into connected stories = Cadwallawns battles in the Red Book of Hergest. Saga excerpts. Sagas – storytellers not court poets. Hence – storytellers = cyfarwydd [popular, official]. Court poets = bard. Poetic northern inheritance – thus recorded 9th century > integrated with their local legends/general myths + traditional folk tales. Basis of world folklore. Thus – southern movement. Gwyddno + Dystan mab Failwch. Gwyddno – hero. Dystan – linked – March of Cornwall = Tristan (medieval romance). Nephew of Mark. But early memorial to Drustanus at Castledore (Cornwall). Link? Reference – Arthur – in Goddoddin = unlikely to refer to non-northern hero. Hence – from beyond north = Gereint rac dehen. Gereint from the south. The Goddoddin = seriously corrupted text. Long transmission, Arthurian reference – interpolation. Northern Arthur = contemporary of Aneurin. Columba – missionary in Scotland (Iona). Contemporary > Aedan mac Gabrain = ruler of Dalriada (Argyll and Kildare). Succession = 574 AD. Aedan – frequent neighbour conflicts (Fortrenn). Thus – Picts (north) kingdom of Fortrenn (east). Relations – Columba + Aedan – recorded in Columba’s biography (by Abdoman). Abdomnan – perhaps Abbot of Hy (/) = century after death of Columba, circa 700. Abdomnan describes two of Columba’s prophesies (concern – Battle of Miathi). Questions Aidan – successor?. Three sons (Artuir, Echoid Find, Domingart). Columba states – none. All three = slain in battle. But let a younger son come to Columba. Younger son = Echoid Buide. Hence = Aidan’s successor. Artuir/Echoid ind = slain later = Miathi. Domingart = killed – England. north of Antonine wall. Battle attracted attention of Irish writers = Annals of Tigernach. These annals = year after the death of Columba (this contradicts the account of Abdoman). Thus “…the slaying of the sons of Aedan, Bran, Domingert and Eochaid Find and Artur, in the battle of Circhind in which Aedan was victor.” Ulster Annals = “…the slaying of the sons of Aedan, Bran and Domingairt,” The Tigernach – confuses an episode in which Bran and Domingart were killed. Domingart was killed in ‘Saxon lands’ with the battle of the Miathi. [Life of Columba]. Thus Circhuid – Cercenn > Compar Anagus or Kincardine O’Neil = all north Maetae, or perhaps an area between Tay and Dee. Further confusion – intro + Pictish king list (Senchus Fer nAlban) = Arthur > grandson (not son) or Aedan. Whereas Conaig = Aedan’s son. Conflicting reports > but all show an Arthur as Aedan’s son. Thus – flourished within decade or so, and 50 miles of area of the Goddoddin. Arthur of Aedan’s family = local, contemporary hero of the type celebrated everywhere else in the Goddoddin poem [Dlariada]. The background of Arthur of Dalriada was Irish, Dalriada – founded by Irish imigrants. Led by Fergus mac Erc – circa 500 AD. Seized Pictish land + common cause with Britons against Pictish tribes. Aedan in Welsh legend = epithet of bradawc (wily or treacherous). Aedan = alliance with Strathclyde (to south). Soon after battle with Miathi – Aedan invaded Northumbria. Defeated at Degsastan (dated by Bede to 603). Aedan’s sympathies > Britons. Degsastan battle > support of the expedition recorded in Goddoddin. Degsastan and Miathi – identical? Faint, distant echo of Arthur of Dalriada = 11th century ‘Life of Gildas’. St Gildas father = Caw of Pritdiu. Lived north of Antonine wall. [Life of Gildas]. Hueil = St Gildas’s brother [killed by Arthur]. Hueil > raid from Pictland > Dalriada. Minan (Man) = reference to Manau Goddoddin or Isle of Man? Athur = rex rebellis. Arthur of Dalriada thus = Scottish chieftain’s son, of Irish descent. Christian – Celtic tradition, leader and warrior. Met death at an early age in battle – heathen barbarians. Circa end 6th century AD. Small, solid frame – local stories, songs of local bards.